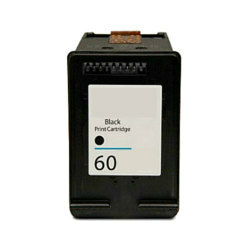 This replacement Hewlett Packard HP 60 black ink cartridge has been thoroughly cleaned along with the printhead nozzles. Then the HP CC640WN was filled with the same ink formulation, the internal back pressure was insured and it was inspected for any possible shell leakage, the operation of all electrical circuitry was tested and finally it was run through an actual print test. If this CC640WN black inkjet cartridge passes our rigid standards, it has been reengineered for your Hewlett Packard (HP) printer. This quick-drying, pigment-based ink offers optimum performance and productivity with superior resistance to smudging and bleeding.